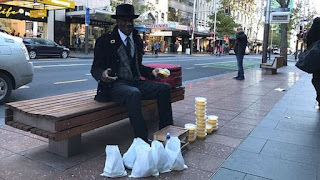 In the 1980s, Larry Woods walked from Rolls-Royce driven by a chauffeur, age-old and extravagant; today he lives on the street vending of wax to polish shoes and says he is much happier. Sitting on a bench on Queen Street, one of New Zealand's major commercial avenues, Larry Wood spends his afternoons shining shoes. Dressed flawlessly, the 60-year-old American offers to polish the shoes of his clients without charging anything for it. But this was not always the job of Woods, who was born in Los Angeles and raised in San Francisco and whom everyone in New Zealand knows as "Mr. Sunshine." In the 1980s, he did not even need to polish his own shoes because he was a millionaire. It all started while still living in the United States, where he met a New Zealander who became his first wife. When her parents became ill, the couple moved to New Zealand and Woods went on to work at the family business, a successful vitamin-selling business. The company was sold, and Woods was rewarded with $ 3.6 million (current $ 12 million). He tells the BBC that it has changed his life radically. "I bought a Rolls-Royce, I had two drivers, I went to parties, I drank. Money turned me into a weak, weak guy because I could have everything I wanted," he says. He remembers that, from that moment on, he did not respect other people. "When you have so much money, you think everyone has to do everything you say, it's something that money can do: make you arrogant, makes you believe that you're better than others because you have more material assets." But in a fortuitous encounter with a Chinese gentleman in a grocery store, Woods realized the person he had become. He used to go to the store every day, where he was attended by a Chinese woman and his mother. One day, who was there, instead of the women, was an 85 year old man. Woods treated him very badly. Each time he placed a product he wanted to buy roughly on the counter, the Chinese man would reply, "Thank you." When I was leaving, I felt very stupid. I apologized and decided that it would never happen again," he recalls. He divorced, his fortune was waning and he was forced to change his life, even being a stripper. Distraught after a few setbacks and without a penny in his pocket, he made an outburst during a medical appointment. It was the doctor himself who helped him reflect and find a new path, says Woods. "He told me, 'You know, Larry, there are three ways you can do things. You can talk about them, think about them or do something about it.'" That's how he started shoe shine 13 years ago. Woods does the service for free. What gives money is a wax to polish shoes and other leather goods, which sells for $ 14 per pot. So you get enough to live. While working, Woods entertains his clients with his cheerful and outgoing manner and his special ability to arouse smiles. "People tell me, 'You made my day,'" he says with satisfaction. "This man is a legend," a young man who visits Woods regularly tells the BBC. "See what he did with my shoes. Imagine then what he can do for his soul." For many people, failing to live in a mansion to move to a two-bedroom apartment from Social Welfare may seem like a decline. But Woods does not see it that way. He says he is much happier today than when he was a millionaire. "I do not need Rolls-Royce, I can take a bus, I do not have to be someone, I just worry about being a good person, that's all," he says. "When I get up, I look in the mirror and do not get depressed." "How can I feel sad when I have so many other things?" "There are many things that can make you happy."